Two of my three children now use iPod touches for gaming. They haven’t totally supplanted their Nintendo DS Lite systems, but the tide is turning in the iPod touch’s favor. Here are some of the most common complaints the kids in my house have made, and how the iPod touch has solved them. [ad#Google Adsense 300×250 in story]The cost of buying a new game for the DS is still much higher than an iPod touch game. You can argue that some DS games offer a richer gameplay experience, but as an impulse buy, it’s easier for a kid to convince his parents to spend $1 – $10 for a single game than it is to spend $20 – $40. Thanks to free trial versions, my kids are able to try out a lot of games before spending their (or my) money. That’s saved them some heartache and it’s saved me some frustration. With three kids in the house, each with their own DS, eventually one will covet another’s game. This usually results in an argument, and sometimes an all out fight. In the DS’s case, the easiest way to maintain some sort of household peace is to buy a second (and in my case, third) copy. But that runs up the price to play dramatically. Fortunately, the iPod touch, iTunes and Home Sharing fixes this problem: Buy the game once, share it around the house. Up to five people, each with their own computers, can share the same apps thanks to iTunes’ Home Sharing feature. And in the case of my younger son, who doesn’t have his own computer, his iPod touch is synced to my Mac. So that doesn’t count as an additional authorization. 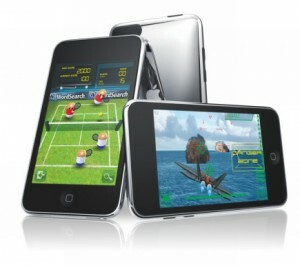 In practical terms, this means that once I’ve bought a game, we can play it on all the iPhones and iPod touches we own. Again, with the iPod touch, this simply hasn’t been an issue. Different games, resident on different systems, occupying different memory. I wish my kids were better organized than they are, but they will occasionally lose track of where they put their DS games. Usually it comes at the worst possible time, like shortly before a road trip, when not having the game is likely to cause both the child and the adults in the house the most stress possible. This issue disappears when all the games are resident in memory on the device. Over the years, my wife and I have collected plenty of games that have been put through the laundry and never work again. It’s like finding two $20 bills shredded up in someone’s pants pocket, and it drives us crazy. I am pleased to report that this never, ever happens with iPod touch games. Sure, the iPod touch itself has a remote chance of being put through the wash, but it’s easier to spot in someone’s pocket than a DS cartridge. And thanks to automatic backups on synchronization, it’s trivial to restore an iPod touch to a previous state if something bad happens to it. Not to say this is a regular occurrence. 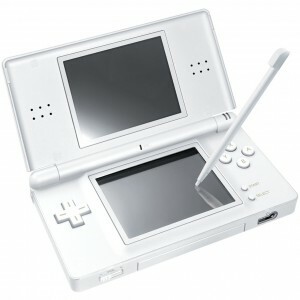 Nintendo DS systems ship with a stylus pen, because one of the screens is touch-sensitive. The devices have a built-in stylus holder, but often times my kids’ styli haven’t made it back to where they belong. This usually means a trip to the store (or Amazon.com) to buy a replacement pack. Those styli also wear down after a while, which again requires replacement. They’re inexpensive, but it’s a pain. I’m an iPhone user, of course. So I have the option of installing the same games that I buy for my kids on my device. That has two practical benefits: I can keep an eye on what they’re playing by playing the games myself, and I can use the games as a way to stay connected with the kids. I’ll admit that some of the games my two iPod touch-equipped kids play hold limited interest for me. But I have a lot of fun with many of the games I’ve bought for them, and it’s a great way of staying in touch with what they’re doing. It gives us a point of discussion after school, when I’m driving them places or around the dinner table. In some cases we’ve played games together over Wi-Fi or Bluetooth. And we’ve also connected through the social networking frameworks embedded in some games. As I said at the outset, the iPod touch hasn’t completely supplanted the Nintendo DS in my house. One of my brood still swears by her DS, mainly because the system has more of the games she likes to play, and despite the App Store’s vast library of games, the specific titles she wants still aren’t there. Games for the iPod touch continue to improve, it’s a sleek and elegant gaming system that more and more kids have these days, and it has utility beyond just gaming: one of my kids uses it to e-mail his grandparents (and me), another uses it to instant message with his friends. From my perspective, and increasingly from two of my three kids’ perspective, the iPod touch is the go-to portable game system that works the best for our lifestyle.